I am a second year rMA student currently writing my thesis on magical writing in contemporary digital culture. I am a founding member of Da Thirst magazine, a UK based expanded form magazine and artist collective. The following is a modified transcript of my research presentation for the 2015 Research Master in Media Studies Thesis Conference. My thesis is an exploration of magical writing practices in contemporary digital culture. This was too much to talk about in 15 minutes, and as such I presented my second chapter: (pre)Cyberspace era perspectives on information technologies. The period this chapter focusses on is mostly limited to the 1980s and 1990s, with a couple of throw backs. 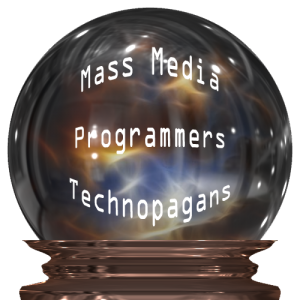 In my presentation I spoke about the interplay between three groups: mass media, programmers and Technopagans. These three groups all employ magical language in relation to – what were at the time – relatively new information technologies. What I argue is that the interplay between these three groups has helped reinforce the idea of the interconnection of magic and technology in the late 20th century, which has left a residual presence in the way we have approached information technologies since the emergence of web 2.0. Sociologist Max Weber famously put forth that the cultural rationalisation of society – which brings with it technological prowess and secularisation – robs the world of its mystery because it can “in principle, master all things by calculation.” Anthropologist James Frazer in The Golden Bough argued that in the development of man, we have shifted from magic at a primitive level, to organised religion, and then to science. There are also, however, more contemporary media theorists such as Jeffrey Sconce and Erik Davis who specifically emphasise the presence of the supernatural in media technologies. Davis in particular emphasises the link between magic and technology going back to ancient Egypt and Greece. I am arguing for the cross pollination of mass media, programmers, and Technopagans with an eye on Friedrich Kittler’s discourse networks, which focusses on the interconnections between “physical, technological, discursive, and social systems” (Winthrop-Young and Wutz, “Translator’s Introduction: Friedrich Kittler and Media Discourse Analysis.” Gramophone, Film, Typewriter, xxiii), as well as of course emphasising material conditions. My discourse network: magic in cyberspace edition, if you will, will crucially consider how the material conditions of these three groups influence the network that is created. Let me start with mass media. For the purposes of this chapter, I am using Time as a microcosm for mass media. This is due to Time being a well established magazine, with circulation numbers at 4.6 million in the mid 1980s; there being existing studies of magical language in Time by William A. Stahl and Karla Saari Kitalong; and the limits of what can be achieved in a thesis project. It would be interesting to do a study on magical language in a wider selection of mass media from this period, but that isn’t currently the aim of my wider research. 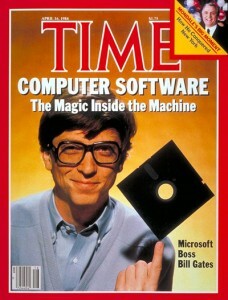 Here we see Bill Gates on the cover of Time in April 1984. We can see in this image that Gates is looking classically nerdy. But he also has a floppy disk levitating on his finger. This combined with the description of him as a “boss” and the announcement that software is that “magic inside the machine” tells us a different story. The floppy disk, as a storage device, is offering the idea that he has information at his fingertips. So we’re really being told two things by his cover: firstly, that software is magic. And secondly, that Bill Gates has power over this magic. What this is doing is reinforcing an idea that has been floating around the programming community at least since the 1940s: that programmers are performing a “black art” or that they are the “high priests of computing”. This idea has been put forth by Fortran developer John Backus, computer scientist Mildred Koss, and computer engineer Robert S. Barton, to name a selection. So this Time cover isn’t coming out of nowhere. It has a precedent, and it is reinforcing that precedent by offering it to a wider audience than would, in 1984, typically be exposed to such discourses. What Time magazine is doing in its application of magic to technology is not innovative but borrowed for different material conditions: a weekly magazine mainly aimed at, to quote Mark Monmonier, “the busy man with neither the time nor the inclination to follow the comparatively longwinded daily press” (Maps with the news: the development of American journalistic cartography, 62). So, here we see the discourse of magic and technology has been adapted for a different audience, for a different purpose: to present computation as an amazing means by which a unassuming geek can gain power over his environment, and control his world. It is also important to remember that Bill Gates, as the “boss” as he is described here, supports this view. Indeed, this is a view that he continues to promote. In the 2015 annual letter on gatesnotes.com – the blog maintained by Gates and his wife Melinda – they refer to software as magic, implying continued support for the concept. People who are into computers and/or practice magic are weird. The points I want to focus upon here are the last two. From a contemporary perspective, it can no longer be stated that only weirdos or oddballs are into computers. Such is the ubiquity of these devices in our lives, people who are into computers don’t necessarily realise it anymore; furthermore, even if one does not actively use computers in daily life, the society in which we live is reliant on software to function. But what about computation as an analogue for magic? Many new media theorists have used magic as a metaphor to describe the executability of code. Florian Cramer, for example, states in the “Language” chapter of Matthew Fuller’s Software Studies: A Lexicon: “Computer control language is language that executes. As with magical language, the word automatically performs the operation.” (The link between magic and automatism is something that gives me pause; I believe that describing the action performed by magical language as automatic fails to acknowledge the material and/or felicity conditions necessary for such magic to be executed. There is little time to discuss this matter here, and the subject is given its proper dues in the thesis itself). The 1990s Silicon Valley programming Technopagans go a step further than Cramer, proposing that the internet in particular, to quote Stef Aupers: “can no longer be understood in a mechanical way since it ‘grows’ and ‘behaves’ in an organic fashion. It should therefore be understood and studied as a natural environment. Moreover, the Internet actualises an ancient holistic claim about the universe: like in the cosmos as a whole, everything and everyone is ‘connected’ on the Internet” (“The Force is Great: Enchantment and Magic in Silicon Valley” 161). Once again, we can see these discourses infecting one another. The invocation of the feedback loop by Pesce is an interesting term to get into here. The loop between the holistic beliefs of paganism, the technological processes of programming, and the utopian wow-look-at-this presentation of software and computation in mass media create a little bit of a garbled message. What we have is a disempowered layman who are told via mass media that technology is magic, but are not privy to the underly characteristics of technology that make it magic; a programming community who either metaphorically think of themselves as sorcerers – as in, all powerful – or literally think what they are doing is magical, that the whole world is connected. Karla Saari Kitalong, in her paper “‘You Will’: Technology, Magic, and the Cultural Contexts of Technical Communication,” additionally criticises these software wizards, arguing that these, considered in tandem with the extraordinary abilities of computers purported in the 1995 “Welcome to Cyberspace” issue of Time magazine, fool the novice into believing that they can master these machines, when software wizards in fact offer the bare minimum of skills required for a specific task, and as such a novice would be easily recognisable by a true expert. 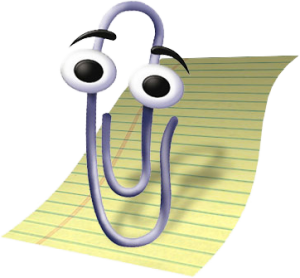 Indeed, I believe that the skeuomorphism of Clippy – there is of course no use for a paperclip in a word processor – further highlights a shift in materiality for laypeople using a computer for the first time, with the characterisation hiding the fact that Microsoft Word and other packages are able to do more than they are immediately apparently able to through the mediation of these wizards. In light of the evidence I have presented, I would posit that the discourse network between these interlinking groups relies on hierarchies of knowledge, from expert to layman who in blocked by interface level obfuscation, both when using a computer and when engaging with mass media, and a shared belief in the power of computing to change the world. So that was then. What about now? In 2015 we are all used to our computers. So used are we to our devices that they have become invisible to us, banal. They no longer amaze with their capabilities, and are described as magical only at times of innovation such as Apple describing the iPad at its launch in 2010 as “magical and revolutionary”. But this is an exception to the rule: I would highly doubt the possibilities of Mark Zuckerberg appearing on the cover of Time in 2015 and describe Facebook as “magical”. And in terms of mass media, that landscape has really changed since the 1980s and 1990s, with high levels of social media usage influencing the way people engage with journalism, television shows, and advertising. The pervasiveness of computers really has changed the way our world functions. So where is the magic? Has it disappeared? I propose in the main body of my thesis that magic has not disappeared from contemporary digital life; it has merely become occult: literally, hidden. As I have shown, mass media used magical language to describe information technologies to emphasise their newness. Now they’re not so new – bar some sporadic innovations – there’s little use for the metaphor. It is, however, still present in the rhetoric of the programmer. One such example I discuss at greater length in my thesis is the gmail importance indicator, that describes an email as important because of “our magic sauce”; this is not only slightly gross, but a facetious interface level attitude to the secret nature of Google’s algorithms. I employ this and other attitudes to argue that despite the apparent transparency of our devices, the source of their functionality is still hidden. Erik Davis, in his Afterword 2.0 for the new edition of Techgnosis: Myth, Magic, and Mysticism in the Age of Information states that horror may be where enchantment is present today in our technology, citing the Slenderman inspired attempted murder performed by two young girls as an example. 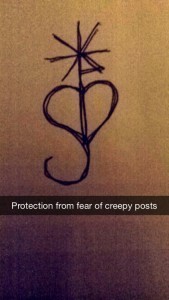 I agree with Davis, and you can see this horror at play in protective hashtags and sigils on Instagram and Tumblr respectively against scary chain posts, and in various feature films such as the recently released Unfriended. Adolescent unease peppers the use of devices that so-called digital natives are meant to be most at home with: I propose that the persistence of the unheimlich for these youthful users indicates that despite their apparent familiarity with the digital realm, there remains an unexplained undercurrent that is filled with tales of magical dread. I therefore propose two strains through which to analyse magical writing practices in contemporary digital culture: adolescent fear of the technologies they have grown up with, and the peeks at programmer power underneath interface level. In my full thesis, I will explore these themes while at the same time working with Ludwig Wittgenstein’s concept of family resemblance to propose a working definition of magic within a digital context, and challenging the assumption that the description of a process as magical are free of labour, immaterial, and automatic.